Maurizio Sarri was left bewildered by the second-half slump that condemned Chelsea to a costly 2-0 loss at Everton on Sunday. The visitors started brightly at Goodison Park and created several chances to open the scoring, in what Blues boss Sarri labelled his side's best 45 minutes of the season. However, the inability to convert that dominance into goals came back to haunt the Champions League hopefuls as Richarlison and Gylfi Sigurdsson struck after half-time for a much-improved Everton. The result dented Chelsea's chances of breaking back into the top four, with three points separating them and Arsenal heading into the final eight games of the campaign. "I think the situation is clear. We played probably the best 45 minutes of the season and then suddenly at the beginning of the second half we stopped to play. I don't know why," said Sarri in a post-match news conference. "It is impossible the situation is a physical problem because if it is you can go down gradually, not in one second. We played really very well in the last minute of the first half, suddenly very badly in the first minute of the second half. "It is difficult for the players to explain to me the change. It is very difficult for me to explain to you the change. Probably it is a mental block I think. 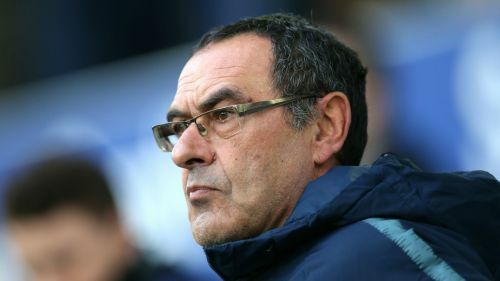 Sarri, who has now presided over four away losses in the Premier League in 2019, denied the players were not responding to his motivational methods. "No, [it was not to do with motivation], because we we started the match very well, with intensity, with a strong mentality," he told Sky Sports. "Tactically, if you don't play, you don't play with any system. We changed the system but it was the same. "The problem was mental. If you have a mental problem on the pitch, the system and the tactics are not enough."